The Gariz Half Case is not cheap (though it's currently around half-price). It's a premium product, and it's boxed like one. 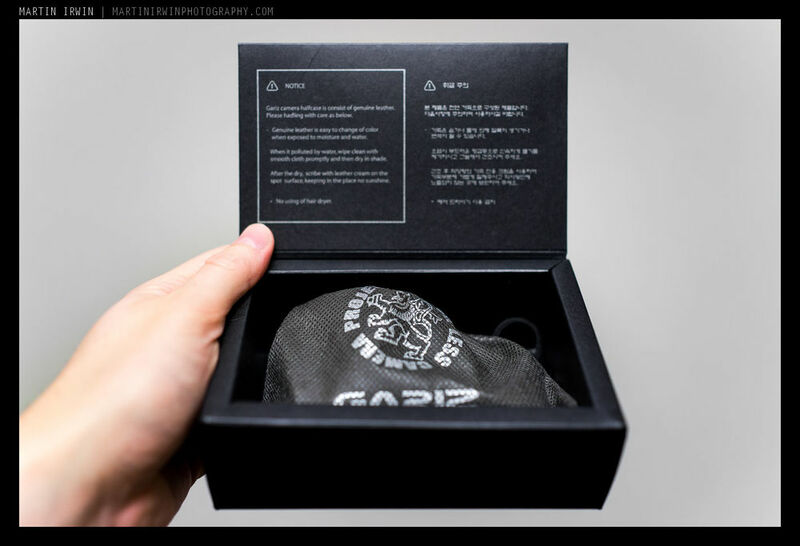 Unpacking the smooth black box, we find a solitary little pouch. In all honesty, the little pouch is nothing special. "Mirror Less Camera Protect" is imprinted on the synthetic-cloth type material. It's nice to have a carrying case, I suppose, but I guess that most people would simply install the case and store the box and its contents away. Opening the drawstring bag reveals the pièce de résistance. The first thing that springs to mind, is quality. The smell of leather, the feel of the leather, and the very sturdy feeling base-plate. It's rather thin, but feels rigid in the hand, though the leather has a slight give. 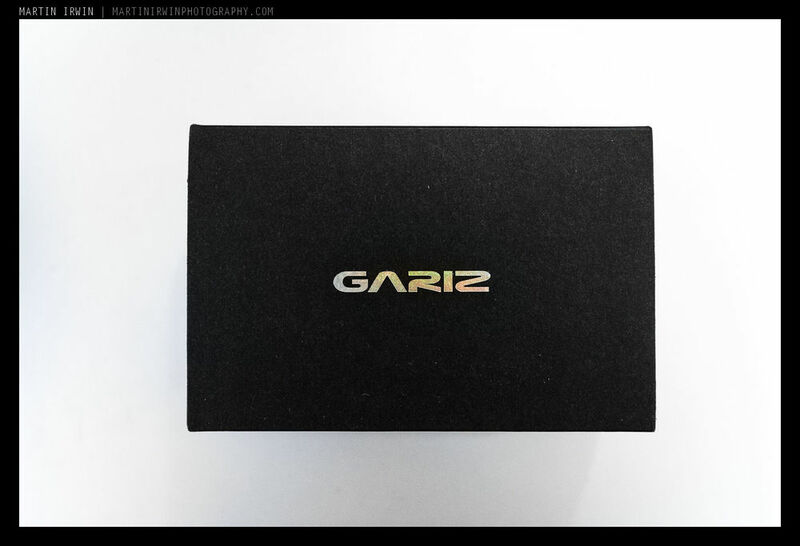 The inside of the case is coated with a soft, felt type material, with an embossed "Gariz" logo - a nice touch. The idea is to protect the finish on the bottom of the camera. The underneath of the case has an additional tripod mount (as the case screws into the tripod mount on the camera body). The tripod hole also acts as a speaker hole when playing back videos, which is a nice touch (and explains the off-centre placement. I'd not rely on this tripod mount for a heavy lens, but most e-mount lenses should be fine. There's a cut-out for memory card access, though I'll touch on that in a moment. Then there's the screw for fixing the case to the camera, which can be done by hand, but is best done using a coin, unless you have seriously hard nails. The case is a very snug fit to the camera, leaving no gaps to speak of. The fit is snug, and adds some welcome grip to the somewhat shiny C3 exterior. In fact, it dramatically transforms the feel of the camera in the hand. My main gripe with the case is that is exacerbates one of my main gripes about this camera - the memory card access. Though it's a dedicated slot, it's fiddly to access at the best of times. I wasn't actually able to open the memory card slot with my nails, with the case attached - I had to use the tip of a knife! Once opened, it's another challenge to eject the card. I wouldn't really fault the case on this too much, as I can't think of a workable solution. The only solution I can think of, involves a different placement of the memory card door, which is Sony's issue (and something they've since addressed with the new A series of cameras (e-mount; A7(R) and A6000). The case doesn't impede use of the camera in any way, and actually adds substantial grip. It's smart, well made, and professional feeling. I've not had the case long, but I would imagine that it will wear quite well. Overall, I'd recommend this Gariz case. I would recommend the Gariz cases in general - I have three of them now. There's nothing like the feel of real leather, so if you're looking for a half-case, this would be the one to get. Faux-leather stuff from eBay won't feel (nor smell) anywhere near as good as this. You can find this half case, and numerous others for your particular camera, from the extensive Camera Cases and Bags collection over at LoveCases.co.uk.